How can you develop more power in your golf swing? That's probably a question that almost all of us want an answer to. Most of us go to great lengths to do whatever it takes to get that power into our drives off the tee. I think we probably all have some ideas of where 300-yard drives come from, but I want to give you the answers without any fluff. Golf swing power is the result of three specific factors. Two out of the three are much more important, but the third does have a bearing on the outcome of how far you hit that ball. The first and probably most evident of the three is your swing mechanics. You're probably not surprised by this one. No. 2 is what we term "golf strength." This is defined as how well your body is conditioned (i.e. fitness) to swing a golf club with maximum power. It's probably the least understood of the three and maybe the most needed by golfers in general. We'll talk more about this later. No. 3 is your equipment. Yes, equipment does make a difference in how far you drive the ball. The equipment manufacturers have let this fact be known and I'll bet we have all gone to the golf shop - probably more than twice - to pick up a new driver that claims to give us another 20 yards on every drive. That extra 20 yards might not be down the middle of the fairway, but it will give you an extra 20 yards -- it could be left, could be right or it could be in the center of the fairway. That all depends on points No. 1 and No. 2 of this article. Equipment and technological advances have definitely lengthened the distance of our drives. But without better swing mechanics and your body in better golf shape, new technology won't help your game. A bad swing will produce a bad result, regardless of what type of new driver you may have just purchased. I think all of us are aware of how important the mechanics of a swing are when it comes to driving the ball down the fairway. It's essential, if you are over the top with your swing or come inside too much, you'll see that dreaded slice or snap hook. The drives will be short, too low, too high, left, right, or a combination of these if you're putting bad swings on the ball. It's essential for a golfer to work on the mechanics of their swing, week in and week out, to improve their game. If it weren't important why would all these tour players have swing coaches that work with them on a consistent basis? The golf swing is such a finite, mechanically complex movement, that requires constant work to keep it highly efficient and in check. One of the most common mistakes I see amateurs make is probably a lack of instruction. I see amateurs over and over at the driving ranges, week in and week out, pounding balls without any improvement. This, I feel, is a result of one of two things: A lack of instruction and/or low levels of golf strength. A lack of instruction leads to the development and ingraining of improper swing mechanics. This only results in slices, hooks, topping the ball and hitting it fat on the course. And we all know that those types of swings lead to frustration and bad rounds of golf. I would suggest to most anyone to find a good instructor and take lessons on a consistent basis. This can only help your game in the long run. 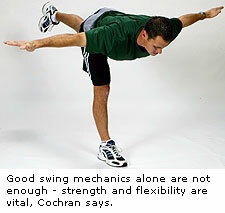 Golf strength is a term we use to describe the golf fitness level of an individual pertaining to swinging a club. This is much different than how much you can bench press or squat, which I like to refer to as "weight room strength." Understand that these two terms, golf strength and weight room strength, are very different. If you don't quite understand the difference, ask yourself one question: How many bodybuilders do you see teeing it up on tour? The answer to that question is quite obvious, none! It comes down to this idea: the mechanics of a golf swing require specific levels of flexibility, balance, stability, strength, endurance and power to perform it efficiently. If your body does not have the required capacities of the aforementioned list, then the result will be a less than optimal and less efficient swing than possible. Essentially, your body supports your swing much like a foundation supports the house you build upon it. I'm sure that all of you would choose to build a house on a stone foundation rather than a sand foundation, wouldn't you? I will say that many of you make a different choice when it comes to your golf swing. I quite often see amateurs developing their swing on a foundation of sand - not a good thing to do in my book. Regardless of how much time you work on your swing mechanics, if your body doesn't have the golf strength to support your swing, you are limiting your potential. I have seen it numerous times: People practicing at the range who struggle, not because of trying to get better, but because their bodies are limiting what they can do with their swing. Quite often I see people with limited flexibility, poor balance capabilities and low levels of strength and power. The bottom line is that your mechanics won't get better until you fix the body that swings the club. A review of the topics tells us that they are optimal swing mechanics and the proper levels of golf strength in the body. One without the other is going to leave you short when it comes to your potential in the game. Again, I probably see point No. 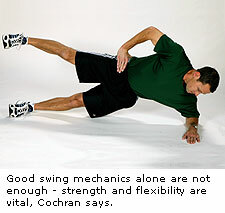 2 (golf strength), being addressed less often than swing mechanics when you get right down to it. The pros are all aware of the importance of golf strength, so you should be, too. We've come to the final point and that deals with equipment. I think the majority of golfers are aware of the technological advances that have occurred in golf equipment over the last 20 years. Think about the '80s when we were still playing with woods that actually had wood club heads. Now we're using drivers with space age faces that shoot the ball off of them at warp speed. In addition, we have to mention the advances in terms of golf balls. How manufacturers design golf balls today makes a huge difference in how far they travel. What a lot of people don't realize is that the USGA has set standards on how "hot" driver faces can be and how fast balls can come off the face of drivers. Most clubs are reaching this limit and anything past these USGA rules becomes illegal to play. No. 1 is improving your golf swing mechanics. Improved mechanics will improve your driving distance. No. 2 is improving your golf strength. By improving your body as it pertains to the golf swing you will improve your distance off the tee. No. 3, equipment does make a difference - if you hit the ball correctly. It is obvious that the strength and height, length of the arms and club, full body turn as well as downswing technique have a lot to do with clubhead speed.What I don't understand is that many professionals including supposed to be the best still believe in centrifugal force as the reason for clubhead speed.It is probably due to less educational background.They need to understand basic high school physics, Ignorance could be irritating.